I have been asking…BEGGING…for a female Roc Solid room remodel, and guess what? After a long 3 year wait, I FINALLY GOT ONE!!! 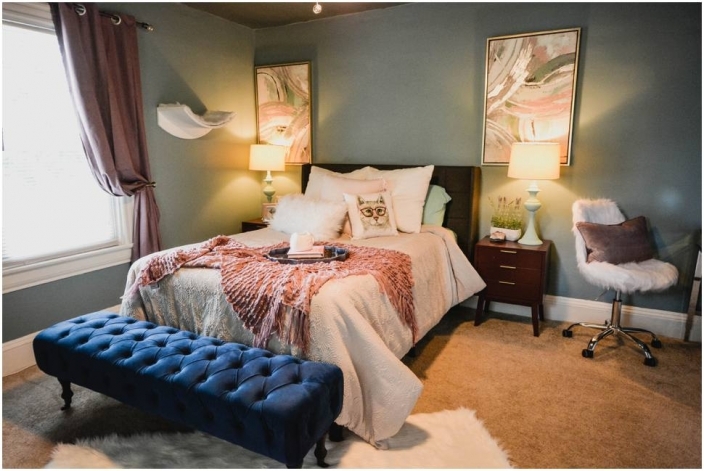 Adia, a gorgeous, courageous, spunky as hell, 17 year old girl from Hampton has been battling ovarian cancer and this past weekend I was given the opportunity to remodel her bedroom. Don’t get me wrong, I love my boys–I love any and all of these kids and their families. I will literally design a room for any child Roc Solid sends my way. Even if I know i’m not available that day or i’m busy with my own work, I will still create the design, do the plans, order the furniture, create a step by step plan for the space…because they deserve it. And because I reallllly love seeing their reactions when they step into their new room for the first time. Adia’s reaction was one of the best yet and the opportunity to step away from the video game, reptile, neon light, sports themed rooms was like a breath of fresh sparkly pink air. I actually didn’t get to meet Adia before the day of the room reveal! Typically, I sit down with the family a month or two before the remodel to go over everything, see the room, take pictures and measurements, get to know the child, etc. Well, I ran pretty blind with this one. Another Roc Solid team member met Adia, got a list of what she wanted along with a few design suggestions and thats what we went on. 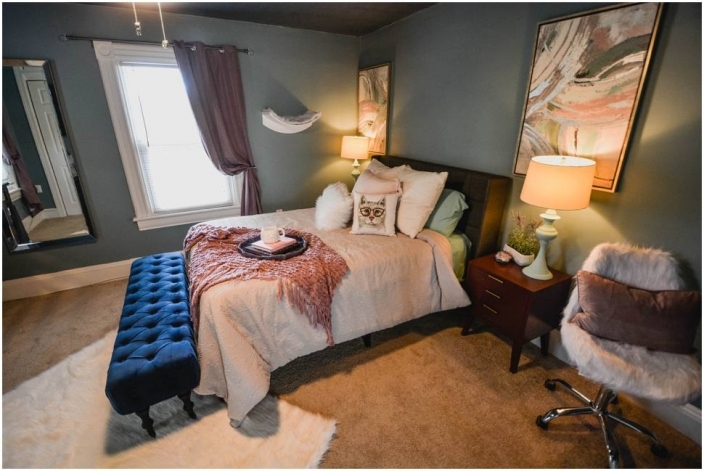 Actually, she wanted a completely different room layout but I had to change it based on the windows…in other words, I was TERRIFIED of her reveal. I just knew she was going to hate it because I made so many assumptions and decisions on my own. If i’ve learned anything growing up, it’s that you really don’t want to mess with a 17 year old female. The Roc Solid volunteers and the amazing sponsor, Gwaltney Foods seriously knocked it out of the park. Gwaltney even got sister a bed frame, mama a dining set, and brother some storage furniture….above and beyond!!! We painted. Everything. Even the ceiling turned navy blue. New light fixture. All new furniture. New layout. Here are the after pictures! Adia, I hope this room remodel provides a stepping stone to all the great things you’re going to do with your life. Thanks for letting me shake things up a little bit. Enjoy girlfriend! !